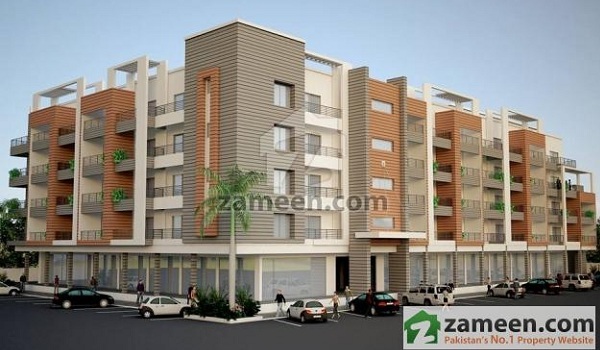 Bahria Heights 7 is Bahria’s upcoming project in Bahria Town Rawalpindi Phase 7. It is a mixed-use development whose ground-breaking ceremony is to be held on Saturday, January 31, 2015. The project is owned by Shahzad Builders but it will be developed completely by Bahria Town in an estimated time period of 2 years, so you can be sure of receiving another iconic Bahria development within the promised time. Bahria Heights 7 has a very tempting location on South East Boulevard leading to Islamabad Highway near the banks of the Soan River in Bahria Town Phase 7, Rawalpindi. The development will have five floors in total, featuring shops, apartments and a high-end restaurant. The ground floor will have room for 34 shops and a restaurant, while the top floor will be reserved for a state-of-the-art gym and servant quarters. The middle three floors will feature 40 one- and two-bedroom apartments. A dedicated and spacious area around Bahria Heights 7 has been reserved for car parking. With three elevators – two meant for passengers and one for cargo – and dedicated back-up power, Bahria Heights 7 is set to become a new standard for the apartment lifestyle in Islamabad. Other features of the development include 24-hour CCTV-monitored premises, community mosque, a medical centre, waste disposal facilities, laundry and maintenance services, conference room, and a community centre. Although the development features only one- and two-bedroom apartments, the investors and buyers can choose among various options that vary in size. The per-square-foot price of these apartments is Rs 8,500, while the per-square-foot rate of shops is Rs 21,000, both of which have obvious potential for appreciation as soon as the project is completed. The total price for one-bedroom apartments ranges between Rs 8,508,500 and Rs 10,837,500 while that of two-bedroom apartments ranges from 14,960,000 to Rs 15,487,000. The price of shops also varies depending on their location and size, and ranges between Rs 5,901,000 and Rs 9,618,000. To book these apartments and shops, you would be required to make a 26% down payment and the remaining amount in two-year instalments. To have a look at the payment plan and others details of Bahria Heights 7, please visit this page.